Merle Lambeth grew up in Connecticut and began making clay objects while living in Texas many years ago. Her work over the years has been an exploration of design, function, and style. 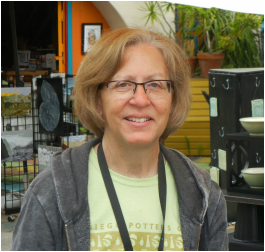 While living in Texas she owned and operated M&R Mudworks for 8 years creating production ware for sale at craft fairs and wholesale markets. She now lives in San Diego where she set up a new studio in 2005. Merle is greatly influenced by simple lines, love of material, honest craftsmanship and attention to detail, which she learned from other studio potters. Most of her training comes from attending workshops around the country. She works with white stoneware and porcelain clay bodies, throwing and altering the forms as well as hand building with slabs. Most of her work is functional and fired in either cone 6 oxidation or cone 10 reduction. For textures, she presses the clay with stamps made out of wood, clay, carved linoleum blocks or found objects while using glazes to add depth and emphasize the shape of the piece. Her love of texture serves as a source of inspiration. “I visualize my pots with a myriad of shapes, sizes and textures". Oval platters with fish, delicately folded bowls with patterns or animals, and altered thrown forms all contribute to her sense of style and design.